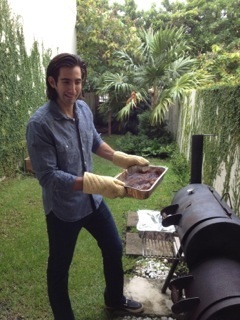 I’m happy to report that son-in-law Gabriel Berthin has mastered smoked brisket, and he has the Horizon smoker to prove it! His wet rub is a no-nonsense mixture of salt, cumin, hot peppers, vinegar, and red wine. Here, he’s using the foil pan method from How to Grill, recommended for smaller, leaner flats. 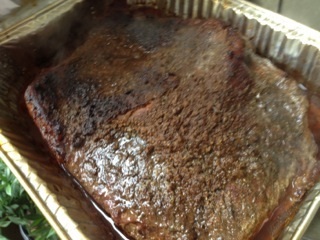 Eight hours later, the brisket is ready to slice. 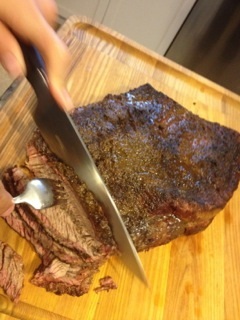 Check out the killer smoke ring on the periphery of the meat! 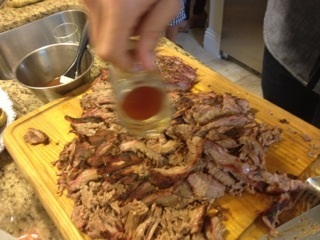 And now, the genius twist: Soak the sliced, chopped brisket in the drippings. 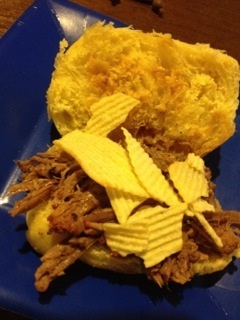 Place on a bun with more drippings and potato chips. It’s a French dip sandwich with crunch…and hickory smoke!